Everybody’s blogging about the inauguration, and I intended to do a book list of Presidentially-related themes, or a list of books I wish the new President would read. Wisely, I gave up that project. The great communicator, as most recent Presidents have, talks about the common people of middle America. About ordinary folks. From sharecroppers to coal miners, single moms to emergency room workers (or, as Obama put it, firefighters) these salt of the Earth folk help make this land great. He suggests he’s interested in the little guy, even the forgotten on the fringes. Petrusich, who writes for the much-debated indie rock review site Pitchfork, and, importantly, is a contributor to Paste magazine, knows her rock and roll. And old-timey bluegrass, blues, old folk, new folk, country, old and new. Heck, she seems to know a lot about ragtime and vaudeville, early jazz, heavy metal and punk. She knows gospel, black and Southern, and just loves the twangy history of American music. And she loves to travel. And she loves to eat. Her descriptions of meals and juke joints and greasy spoons (and an endearing short chapter on Cracker Barrel) makes me hungry, like those PBS shows about the best road-trip diners or regional sandwich places. Man, I want to get me one of those Corn Nuggets from Banks Dairy Bar near Vicco Kentucky, which seem to be a ball of battered and friend cream corn. With her good ears and eyes, we learn about the culture that gave rise to the blues; about the huge plantations and their shacks, cotton sharecropping, the Mississippi Delta, and the nuances between several different kinds of blues, even beyond the classic schools of Delta and Chicago. She is quotable, interesting, and has the storytelling chops to know when to shift from detailed citations of her research to describing the sloppy BBQ she spilled on her white tank top. She goes to Memphis, of course. The story about Sam Phillips and Sun Records in fabulous and important. She goes to Nashville, and is gracious, if critical. The way country music developed a big pop sound in the 60s—she names the producers, the studio players, the hits—is much lamented by country purists, and it gave rise to the Outlaw sound, itself rather co-opted by commercial interests. She eats and drinks and travels and talks, telling the story of her drive, her hotel stays, people she meets, records she buys. Like any good road trip, there are detours, literal and figurative, as she sees, and tells us, the oddest mix of stuff. And then she is back to the history, the pop culture studies, the stories of these great American heroes, from the Carter Family to Lead Belly, from Alan Lomax and his field recordings for Folkway (now owned by the Smithsonian) to, yes, Elvis Presley. To say she’s “going to Graceland” is an understatement. She knows this stuff, cares about it and, it seems to me (or is it wishful thinking?) see a solid stream of redemption through it all. Some of our readers will be fascinated by her chapter on what is sometimes called alt-country, No Depression music. (The name, picked up by the rag of that same name that reviewed this neo-country tradition, comes from a line from Carter Family song covered by folkster rockers Uncle Tupelo—the predecessor of Son Volt and Wilco, staples in the No Depression scene.) In fabulous overview, she connects dots as diverse as John Prine and Gram Parson and the Byrds and Neil Young, and the guys from Uncle T to the oddly appealing Bobby Bare, Jr to grunge rockers like Pearl Jam. (Later, she continues this trajectory in a chapter on hyphenated indie-rock, discussing guys like Sam Beam from Iron and Wine.) She names the clubs where she sees ’em, describes albums, tells who plays with who, and who thinks the whole alt-country thing can’t be defined. And, the roads she travels to get to these interviews. She’s a good writer, as I’ve said, but there was one line that didn’t fit. She mentions her Diet Coke. Sigh. e the first to think it through theologically. It Still Moves is a wonderful read, a fun and clever book, a road trip down, and beyond, Highway 61, complete with soundtrack. (Even the cover is printed in a way, with thick ink, suggesting a silk-screened music poster.) Yet it is more that a memoiristic travelogue. It is a caring look into the American Southland, with its friendly populace, its poverty, its odd history of blacks and whites making music together, and the legacy of slavery and the Klan. It is a tale which twists like the Mississippi and is as heavy, and beautiful, of the glorious Appalachian mountains of Eastern Kentucky. From the NC hollers to the MS delta, she traces how this geography and culture shaped music which has become–and continues to become-something very uniquely American. Presidents, especially this good one now, like to talk like populists. My hunch is they mean well, but aren’t, really. Granted, in the years of campaigning, they really do get out to the hinterlands and meet thousands of people, rich and poor. (Still, how ’bout that story of VP Biden talking about his beloved diner where he chows down with the locals, which, it came to be known, had closed a decade earlier. Guess he wasn’t a regular there after all.) Amanda Petrusich could take you to some diners. She’d get talkin’ about local music. She’d catch an unknown playing in some coffee shop or back room. She’d buy a locally-made CD with poorly photo-copied artwork. And she’d make you very, very glad to be a part of a country with such enterprising music makers, such good highways, and so many backroads. 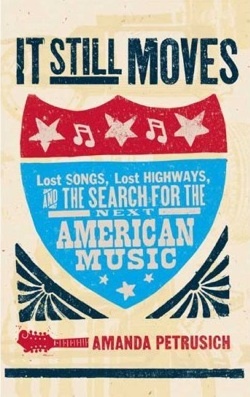 Maybe It Still Moves…The Search for the Next American Music should be on the Presidential reading list after all. Here is an interview with her from Salon, discussing the book. Enjoy.